Add on a Razer Core X for £259.99. Add on a Razer Atheris for £54.99. Add on a Razer Rogue 13.3" Backpack for £59.99. Wild savings of £90 off. While stocks last. "Our highest recommendation for gaming-inclined seekers of ultraportables"
"The most powerful ultrabook you can buy"
"It's the fastest 13.3-inch Ultrabook we've tested with graphics performance.."
"It's so dope I can't complain." More Games. More Power. More Places. The new Razer Blade Stealth 13 laptop is now available with a more powerful NVIDIA® GeForce® MX150 4GB graphics and the new Whisky Lake Intel® Core™ i7 processor for up to 4X performance increase in gaming and content creation.¹ Featuring up to 4K resolution in a thin bezel 13.3” display, a new Razer Chroma™ keyboard, the Razer Blade Stealth combines mobility and style with power that’s perfect for work and play. Available NVIDIA Graphics Push more pixels in Overwatch, Fortnite, and popular MOBA games with the available NVIDIA® GeForce® MX150 (25W 4GB GDDR5 RAM) graphics. Combined with the quad-core Intel® Core™ i7 processor with turbo boost speeds up to 4.6GHZ and up to 16GB RAM, the Razer Blade Stealth has even more performance for video editing, content creation, and higher frame rates when gaming. Ultralight and Ultrathin The unibody frame is fortified using precision CNC-machining of high-grade aluminum, and its stealth black color is anodized into the aluminum at a sub-molecular level for maximum durability. 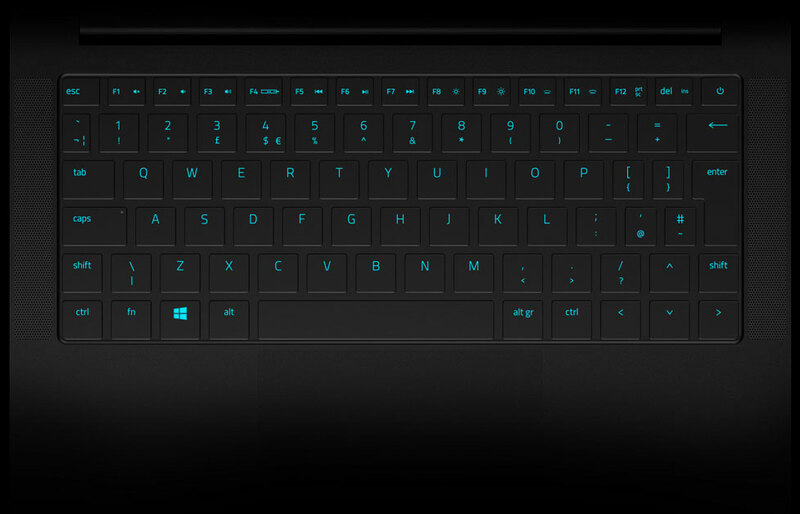 The design now features a tone-on-tone Razer logo for a sleek appearance. Micro Bezel The new thin bezel 13-inch Full HD matte display is individually calibrated to ensure acute color accuracy. Featuring 100% sRGB color saturation for exceptional visual clarity whether you’re working or gaming. 8 Million Pixels+ A thin bezel 4K display with 100% sRGB compatible colors produces high-resolution visuals for cinematic clarity, and a touchscreen that provides greater productivity. The Razer Blade Stealth’s 4K display is individually calibrated to ensure color accuracy out of the box. Razer Chroma™ The keyboard features Razer Chroma™ single-zone RGB lighting for limitless personalization and style, and a precision glass touchpad that gives you accurate touch controls. FULL I/O Stay equipped with a full array of connectivity including Thunderbolt™ 3, USB-C, USB-A, wireless AC, and Windows Hello infrared camera, allowing you to connect faster for total adaptability. 4X Speakers + Smart Amp The four stereo speakers and smart amplifier provide greater audio boost and clarity. Dolby Atmos® replicates sound in a 3-dimensional space for lifelike immersion that flows all around you. Windows Hello: the password is you. Windows Hello is the password-free sign-in that gives you the fastest, most secure way to unlock your Windows devices.⁴ Using your face, PIN or companion device, it recognizes you apart from all others and waves you in with a friendly hello. Handles sign-in and authentication on compatible apps and Microsoft Edge websites, too. 1) Performance compared to previous generation Razer Blade Stealth with integrated graphics. 2) Razer Blade Stealth testing with 8th Gen Intel Core i7, Intel® UHD Graphics 620, 8GB RAM, 256GB SSD, and FHD display. Actual battery life varies depending on product configuration, software, usage, power management settings and other factors. 3) Razer Core X and desktop graphics card sold separately. 4) Windows Hello requires specialized hardware, including fingerprint reader, illuminated IR sensor or other biometric sensors and capable devices. Thunderbolt and the Thunderbolt logo are trademarks of Intel Corporation in the U.S. and/or other countries. Intel, the Intel logo, the Intel Inside logo and Intel Core are trademarks of Intel Corporation in the U.S. and/or other countries. Copyright © 2018 Razer Inc. All rights reserved. Razer, For Gamers By Gamers, and the triple-headed snake logo are trademarks or registered trademarks of Razer Inc. and/or affiliated companies in the United States or other countries. All other trademarks are the property of their respective owners. Actual product may differ from pictures. Information correct at time of printing.